(At $45 new, it was fancier than the $32.50 Duolian, but still very common. And the maple neck doesn't sound as good as the mahogany neck Duolian. 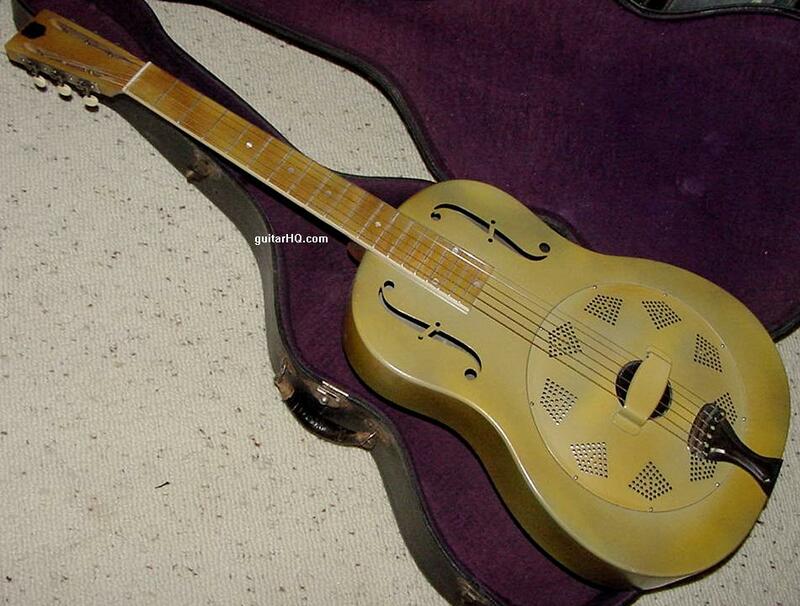 General Comments: Single cone resonator with a steel body and maple neck. 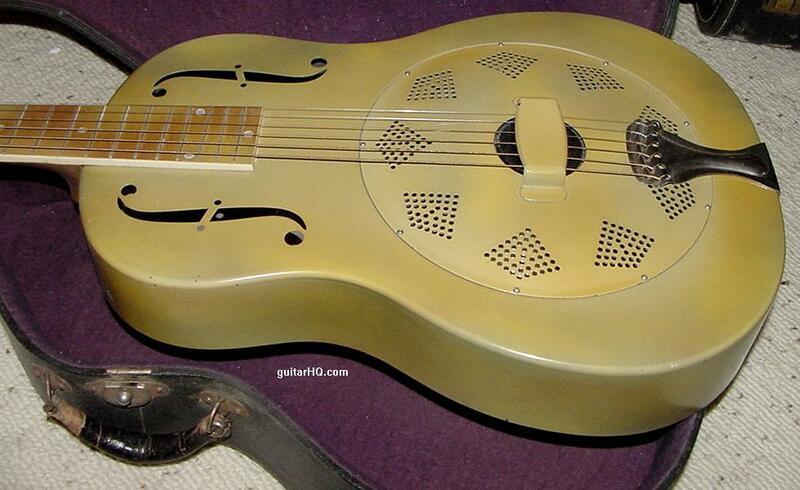 A basic National single cone resonator guitar model. A good sounding guitar, just not very fancy. I especially like the 1929 to 1935 metal body Triolians with the Polychrome finish and the black stenciled Hawaiian scene on the back. 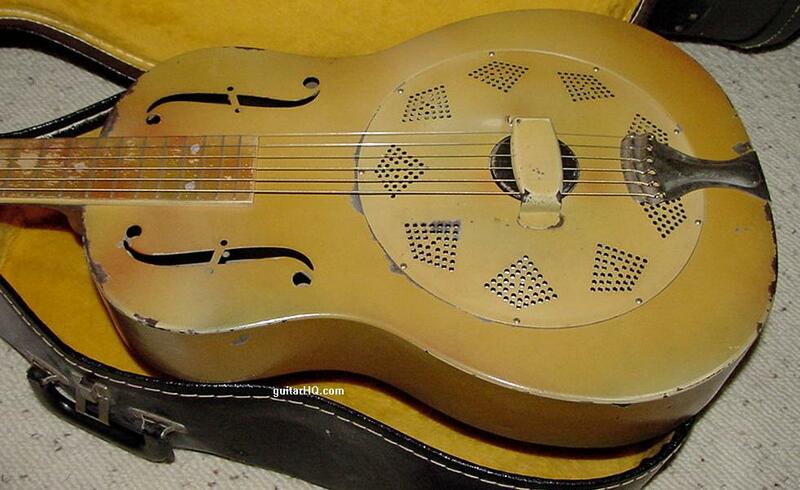 I would really like to find a 1934 National Triolian in Polychrome with 14 frets clear of the body! If you need to figure out the exact year of your National Triolian guitar, use the serial number. See the National Serial Number Info web page for help determining the exact year. Wood body, Maple fingerboard, no binding, Round maple neck, 12 frets clear of the body, Slotted peghead, Flat fingerboard radius, "National Triolian" decal on peghead, Multi-hued Polychrome tan-yellow finish with pink & purple highlights, Opaque neck & fingerboard finish same as body, Decal on back was first a flower bouquet, then changed to a hula girl. 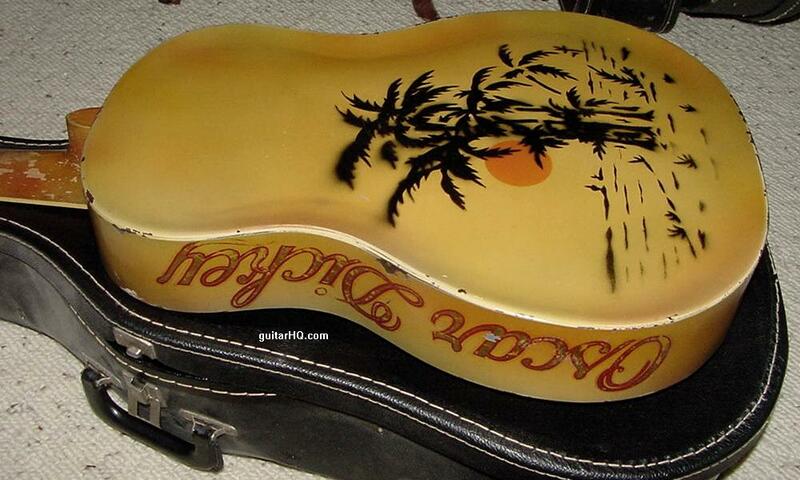 Last few wood models have stenciled Hawaiian scene. Steel metal body, Maple fingerboard with binding, Walnut sunburst finish or Polychrome tan-yellow finish with red & blue highlights, Sunburst models have ebonized fingerboard, Polychrome fingerboard finish is clear with faint red & blue highlights, Stenciled black Hawaiian scene with orange sun on back, Bakelite neck used 1929-1930 but discontinued due to warping & cracking (no binding), Flat cut f-holes. Polychrome body finish changes to pea green with faint highlights, Polychrome fingerboard finish changes to ebonized black. Rolled edge F-holes, Square neck available special order. 14 frets clear of the smaller body, Round basswood neck replaces maple, 10 inch fingerboard radius. 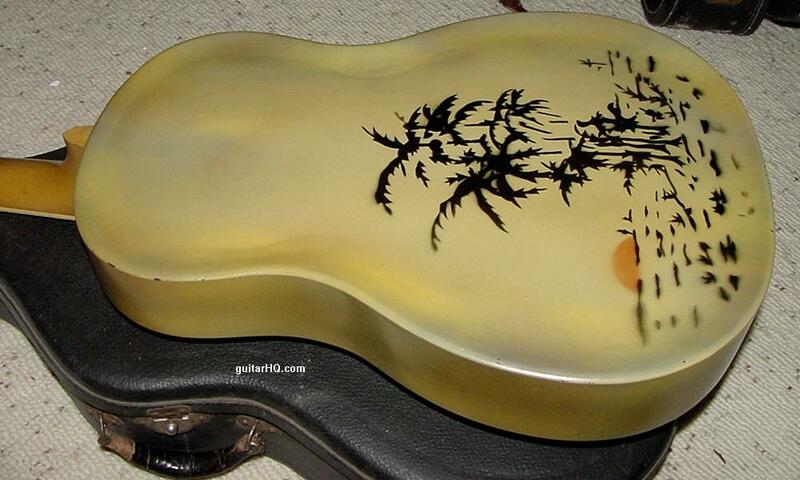 Solid peghead, Polychrome and sunburst body finishes discontinued, "Piano" body finish, simulating rosewood grain. Rosewood or "Red bean" fingerboard. Pickguard added (sometimes black, sometimes wood grain with diagonal stripes). 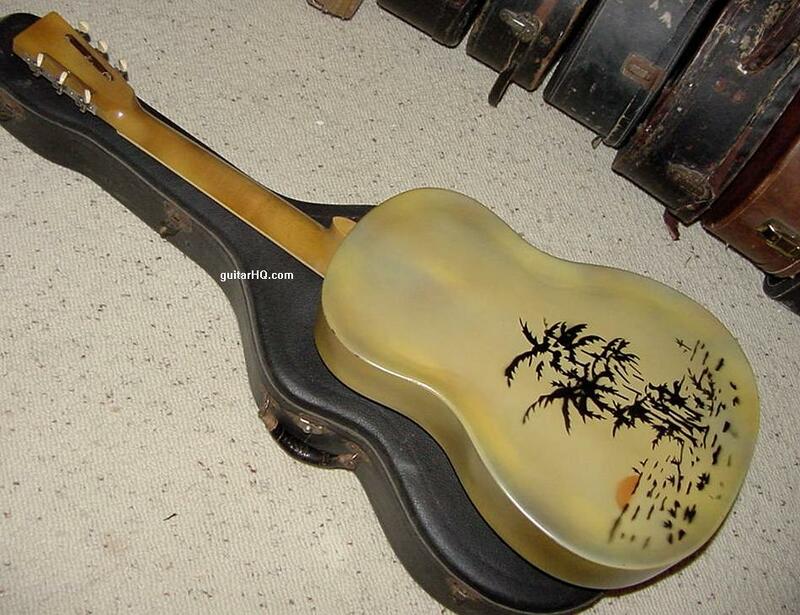 National Triolian guitar discontinued 1938, replaced by the Collegian. 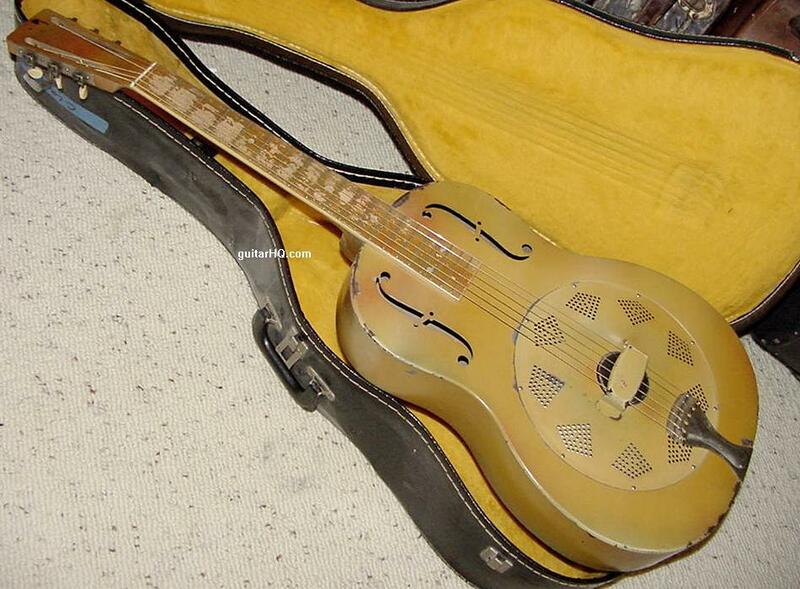 A 1929 National Triolian in Polychrome finish, original hardshell case. This example is very nice, but the blue and red colored highlights are barely visible. A 1930 National Triolian in Polychrome finish, non-original case. This model is not very clean, but the red colored highlights are very visible. 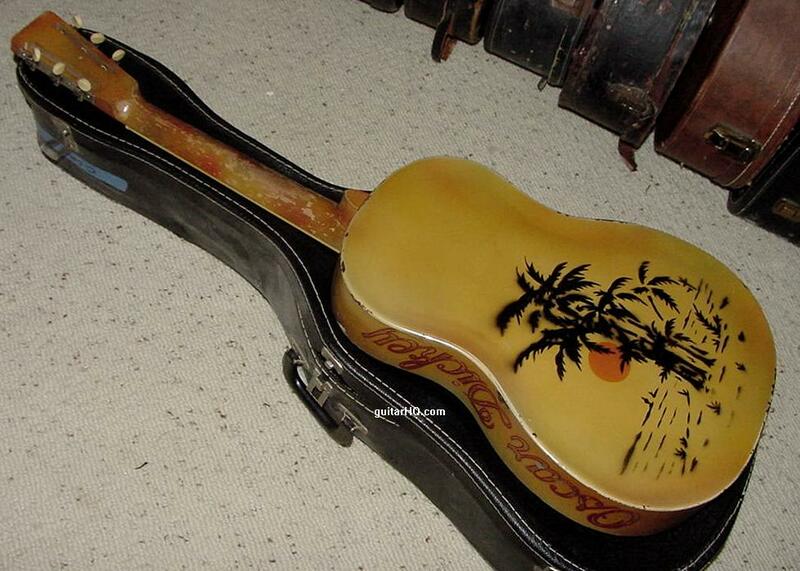 Obviously this guitar once belonged to Oscar Dickey (I'm not sure who he is).